REHAB EQUIPMENT SALES REPRESENTATIVE – Alberta, Sask. & Man. An enthusiastic professional with a minimum of three to five years of Rehab Equipment sales experience, you bring excellent customer service skills and a keen desire to reach new career heights. Your proven sales track record will be put to the test in this role, and the rewards will reflect your results. Relevant education in Kinesiology or ties to the medical referral community will be a definite asset. 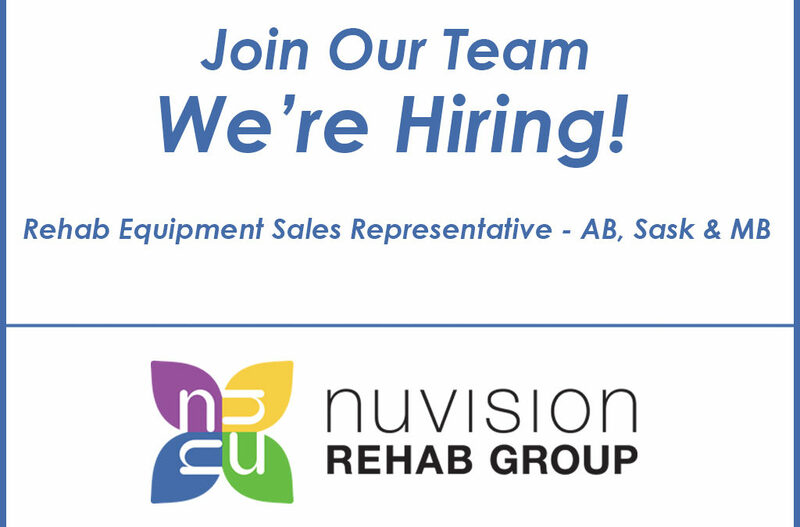 Qualified applicants are invited to send their resume attention, Human Resources Manager, e-mail: hr@nuvisionrehab.com. Only those candidates that meet our qualifications will be contacted. NuVision Rehab Group has a proven track record of working closely with dealers and therapists to ensure their patients’ rehabilitation needs are achieved. NuVision Rehab Group is focused on representing high-end rehabilitation manufacturers to bring a unique service to our local dealers, therapists, and health care professionals. Our goal is to sell and to educate the market on the latest in rehab technology.